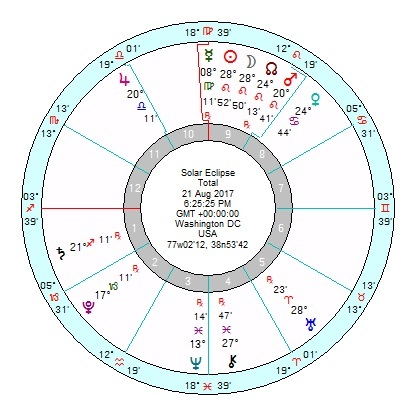 The Great American Total Solar Eclipse on 21 August 2017 at 28 degrees Leo will be seen across the USA, falling exactly on the midheaven through Houston, Texas, down through Mexico and due north up through Canada. It is in a Saros Series that was around previously in 1999, 1981, 1963, 1945, 1927, 1909. Usually this series places strains on personal relationships, induces hasty decisions on the basis of false information, and is associated with tiredness or health problems. Set for Washington, DC, the Leo New Moon is 9th house conjunct Node Mars also in Leo trine Saturn in Sagittarius trine Uranus in Capricorn – so a Fire Grand Trine; formed into a Kite by Uranus opposition Jupiter which is in turn square Venus opposition Pluto – a Cardinal Grand Cross. The New Moon will be conjunct Trump’s Mars and Ascendant as well as (maybe) opposition the USA 1776 Aquarius Moon (depending on start time). An eclipse conjunct Mars tends to stoke up anger, so can be argumentative if not violent, accident-prone and overly stressed. At that point Trump has another of his wild confidence tr Pluto square his Jupiter and a feeling-unloved tr Saturn conjunct his Moon – so he’s likely to be over-reacting. A Fire Grand Trine tends also to be supremely confident, taking risks without much thought of what comes next, inducing selfish and ego-centred impulses. Burnout can be a problem. On the absolutely best reading, this could be a magnificent entrepreneurial plan to Make America Great Again (sic). Though Mars Saturn Uranus tied into the Eclipse is aggravated and reckless, especially with a buccaneering Uranus opposition Jupiter. Previous Eclipses in this Saros series, every 18.5 years, make interesting if worrying reading with some events happening earlier than August and some the following year, as is customary with Eclipses which tend to cast a shadow in both directions. 1998/9 – Bill Clinton impeachment, Dec 98 to Feb 99. 1981 – Attempted assassination of Ronald Reagan in March. 1963 – Assassination of JFK in November. 1945 –August: Hiroshima and Nagasaki atomic bombs dropped. Death of FDR (by natural causes) in April. Calvin Coolidge, was in the White House, a Republican president since 1923, small-government conservative, supported racial equality, relatively scandal-free after predecessor Warren Harding’s less than stellar performance. 1927 also saw various natural and man-made disasters of historic proportions – St Louis tornado, Vermont floods, Pittsburgh gas explosion. In 1928 a California dam fails with 400 dead, Florida hurricane kills 2500. 1909: Assassination attempt against President William Howard Taft while on a visit to Mexico. He was Republican anti-African-American, said in his inaugural address he wouldn’t appoint them to federal jobs; anti-conservationist, protectionist; broke with many of his predecessor Theodore Roosevelt’s policies. Democrat Woodrow Wilson won the following election. So certainly this Eclipse presages violence in one form or another. In general there will be a huge amount of unrest in the US in 2017 with tr Uranus square the USA 1776 Mercury opposition Pluto – and tr Uranus is in August 2017 reversing back to square the US Pluto again; with tr Saturn exactly opposition the US Mars which is at least accident-prone if not militarily involved. There’s not much on the Inauguration (Trump 1st Term) chart at that point. Though the foreign relationship charts (see post below) look nerve-wracked and insecure from May 2017 onwards. Eclipses do cover events in advance of the due date. From a previous post on events connected to tr Uranus square the USA Mercury opposition Pluto. ‘The USA 1776 chart has only one opposition of Mercury in Cancer opposition Pluto in Capricorn – and tr Uranus started to pick up the square to Mercury mid 2016 and continues on till early 2018. Mercury Pluto is overly intense and tr Uranus throws an excitable firecracker into the mix. Looking back on previous tr Uranus hard aspects to that opposition, it is really interesting. Oct 1973 to Oct 1974 – VP Spiro Agnew resigns faced with tax evasion charges. Watergate is raging, escalating and ends with Nixon’s resignation to avoid impeachment charges, as tr Uranus squares the US Mercury for the final time in August 1974, tugging on the US Pluto. On a previous occasion – April 1933 to April 1933 – President Franklin D Roosevelt declares a national emergency to come off the Gold Standard; and the Business Plot was uncovered which was an attempted coup d’etat against the government and Roosevelt’s progressive policies, by a group of fascist veterans and wealthy businessmen, wanting to ally themselves to Hitler’s Germany and Italy. At the time it was written off as a hoax but there did seem to be some wild scheme in place. Just a final caveat. The 1999 Solar Eclipse which had worse aspects than this one ran across the UK and all manner of dire predictions were sparked off. In the event it was a damp squib at the time; though a series of catastrophes did ensure 18 months later when the aspects repeated. Please put me on your mailing list and let me know what you charge for a reading. I have my North Node at Leo 27 7th house in my birth chart, how will this effect me? Just a historical point: I believe it was attorney Joseph Welch who posed to McCarthy the question, “Have you no sense of decency, sir,” etc. and not Ed Murrow. This is obviously not a significant difference, but for the sake of accuracy I send this along. Best wishes. Not sure about civil war if past experiences are anything to go by – in the sense of not Dem v Repub, liberal against right. The pattern leans more to vicious squabbles/conspiracies within the far-right which may involve organised crime and criminal behaviour amongst politicians as well. Thanks; so, different boss, same plot lines. Larry, I could see a scenario if Bannon is edged out and the ‘swamp’ of Washington old timers takes over, as in a sense they have to since they understand how it all works. Not that it does work, but you can’t shoehorn complete ingenues in to run an enterprise as complicated and extensive as a USA administration. And if Trump backs away from his more florid and outrageous campaign promises, that the alt-right would mount a rearguard action. That would fit past experience. Thank you for the response, Marjorie. We live in interesting times. The post by Unmystic Mom above is noteworthy. The 9th House emphasis of the eclipse chart along with the Saros Cycle it is occurring within points towards some type of legal challenge against the president’s authority. Could also point towards strikes or civil unrest. Wonderful summary, Marjorie! A possible trigger for a guerilla civil war in America? I’m not normally a fearmonger, just a cynical realist. Thanks for the heads up. Have amplified the above post. 1927/28 was hair-raising. Definitely an Eclipse which hits the USA in a hot spot. I did wonder when I saw 1963. These Solar Eclipse Cycles repeat every 18.5 years. 1909: President William Howard Taft, Republican anti-African-American, said in his inaugural address he wouldn’t appoint them to federal jobs; anti-conservationist, protectionist; broke with many of his predecessor Theodore Roosevelt’s policies. Democrat Woodrow Wilson won the following election. Was an assassination attempt against Taft in 1909 when he was in Mexico. Huh. Will expand further when time. 1927: Calvin Coolidge, Republican president since 1923, small-government conservative, supported racial equality, relatively scandal-free and popular after predecessor Warren Harding less than stellar performance. Just a casual comment about the years listed for the Saros cycle that you mentioned. There were either attempts to end a presidential term or an actual end of a presidential term in the years listed by you (1999, 1981, 1963 and 1945). I wonder if that presages anything for either Obama or Trump. Can you have a look at this pattern astrologically? Can you also list other years in this specific Saros cycle to see if they confirm a pattern?